“Julius” by STRFKR, from the album Reptilians. This song has never grown old for me, still love it as much as the first day I heard it. 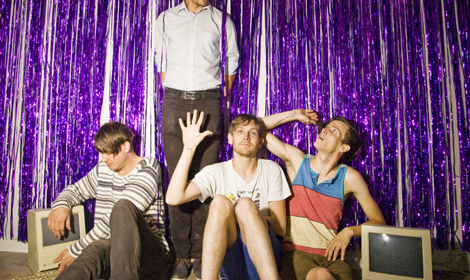 STRFKR – “Julius” from Consequence of Sound on Vimeo. I’m just loving this song right now. It comes from Portland’s Starfucker (STRFKR) and their sophomore release of Reptilians, the bands second album and first with Polyvinyl, due out March 8. As with the bands previous albums, the bulk of the material was written principal songwriter and multi-instrumentalist Joshua Hodges, this time with sound advice from Keil Corcoran and producer Jacob Portrait (The Dandy Warhols, Mint Chicks). Expect ‘vibrant crescendos, explosive drum beats, and layered melodies’ that are seen in the bands’ enthusiastic, theatrical live show. Polyvinyl is offering a limited edition run of 180-gram clear vinyl for Reptilians, as well as an instant download of the album for allpre-orders.